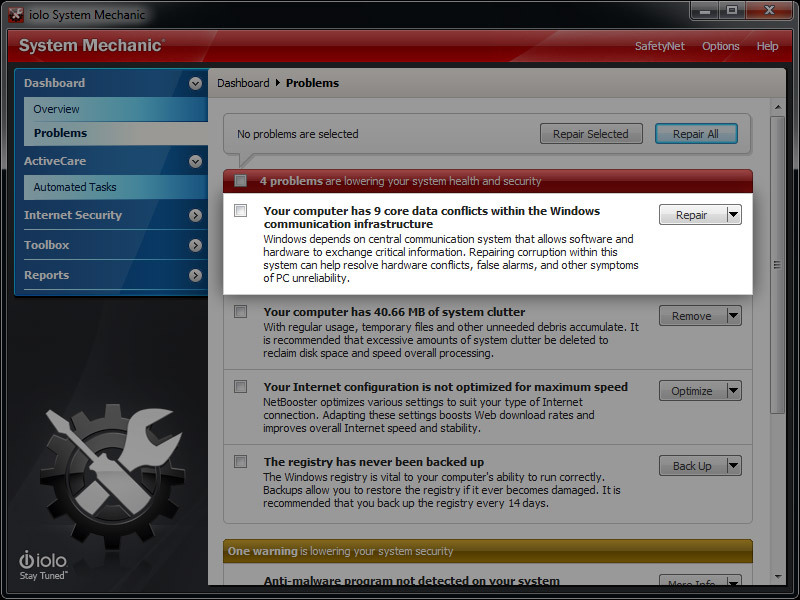 System Mechanic continues to push the boundaries of what your PC can do for you. 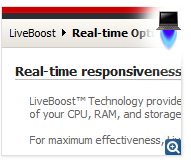 Exceptional improvements to LiveBoost™ real-time responsiveness technology deliver a more agile machine that’s tuned even better to your needs. 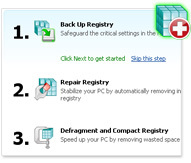 Enhancements to Windows customization settings give you more system control, while a wider array of diagnostics monitor and help protect your PC’s health. 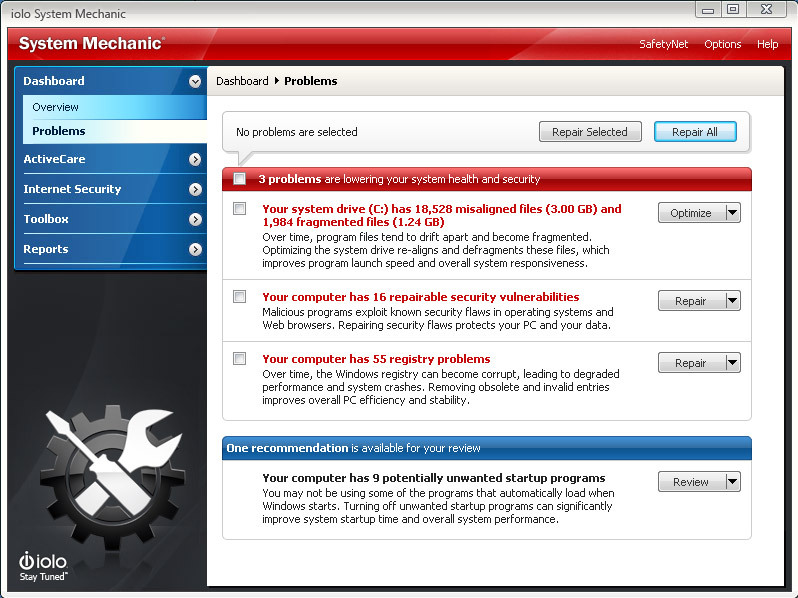 These performance, configuration and diagnostic improvements represent the smartest version of System Mechanic yet. Your PC will stand at attention, ready to go when you are. Enjoy even more speed and less lag while running intensive programs and games. Enhanced OptiCore™ now thwarts CPU-taxing programs faster for further improved system response. 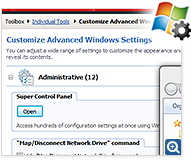 Now available to Windows 7 and 8 users, the Super Control Panel puts dozens of hidden Windows settings at your fingertips to customize your system for more personal computing. Refined RAMJet™ technology now uses a three-tier approach to free trapped memory much more aggressively from unused or idle apps during heavy activity. 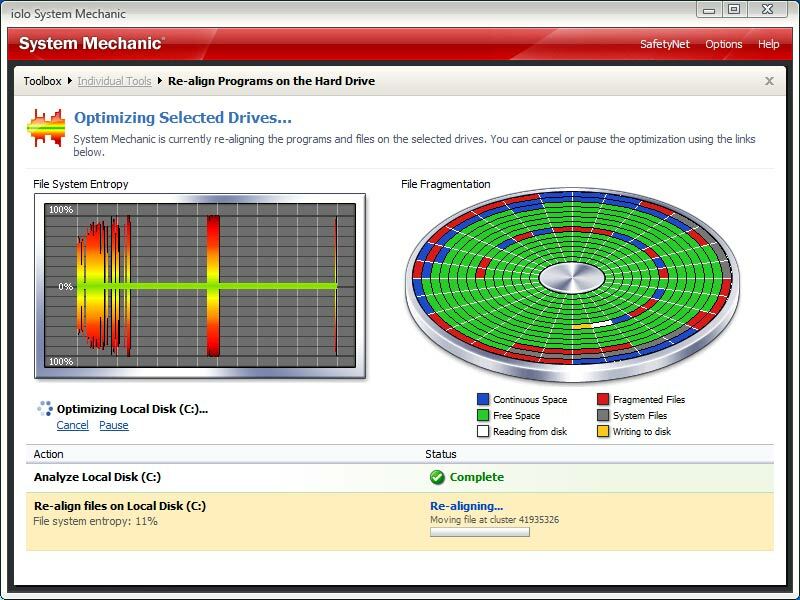 Enhanced DriveSense™ helps you avoid catastrophic crashes through an advanced matrix of powerful hard drive diagnostic tools. 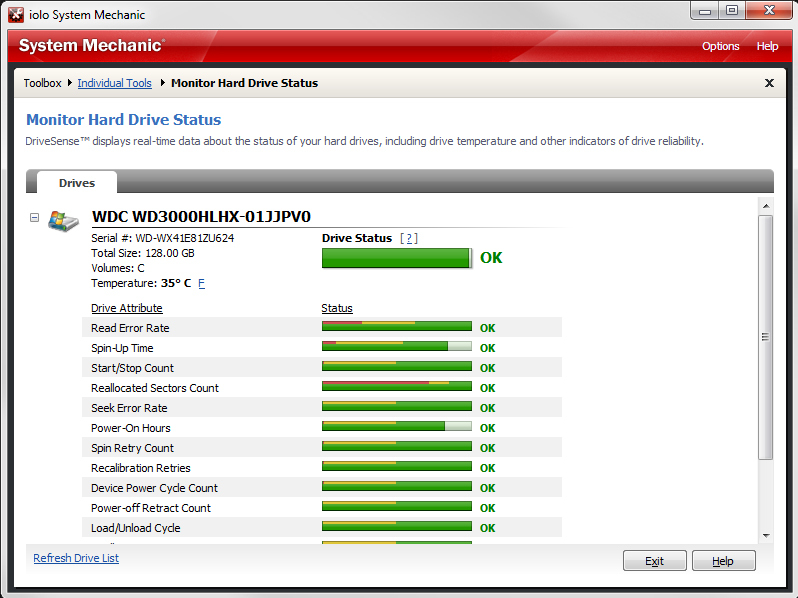 Updated to recognize the latest new drive types. Science-driven power: Uses iolo Labs’ research data to automatically fix over 36,000 different types of problems and errors. A wise investment: Helps make old PCs run like new again and keeps new PCs running smooth, avoiding headaches and premature replacement costs. The expert’s choice: Consistently ranked most effective in improving PC performance by independent test labs. 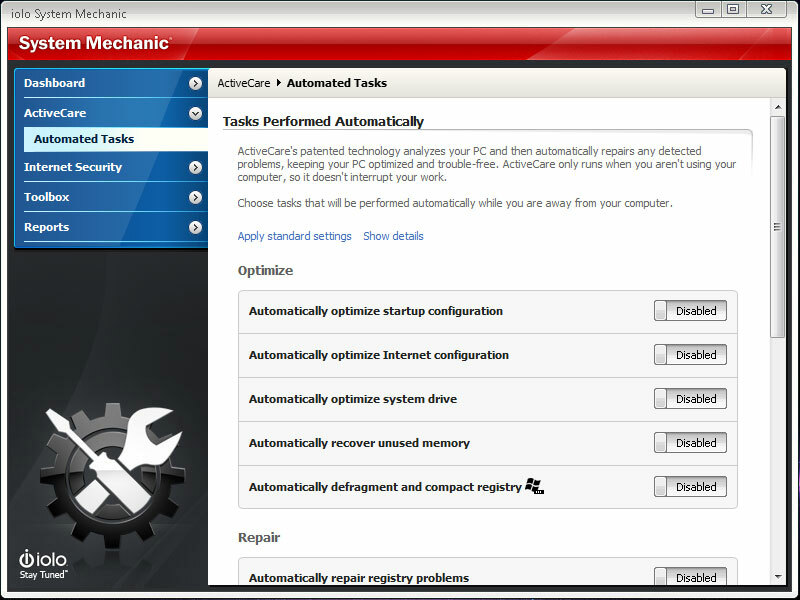 Patented automatic maintenance: iolo’s patented ActiveCare® technology automatically maintains your PC while it isn’t being used. 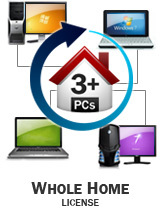 Unlimited home license: iolo’s breakthrough Whole Home License® allows unlimited product use on all your home PCs. Compatible with all versions of Windows: Optimized for each version of Windows from XP, Vista, 7, to Windows 8, iolo ensures its products are always on the cutting edge. Your computer’s ability to respond quickly to the operating system and the programs it runs is based on a critical triangle of components: the Central Processing Unit (CPU), RAM and the Storage Drive. If performance at any point on this triangle is impeded, the entire triangle is affected and your computer develops sporadic lags and glitches. LiveBoost Technology opens the door to “performance at the speed of thought,” even though today’s applications try to aggressively monopolize your computer. 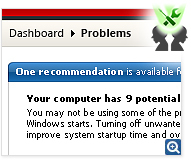 Many programs like to think it’s all about them and try to grab all of the CPU’s attention. 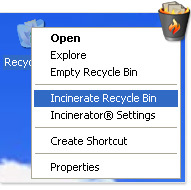 OptiCore automatically identifies and contains programs that try to grab too much of your processor’s resources, helping end the conflict between your needs and what the operating system needs. It is optimized for single, dual, quad, 6 and 8 core PCs and helps reduce lag on Windows 8.1, 7, Vista and XP. In System Mechanic, OptiCore has been enhanced to classify those greedy apps even faster, so you experience even more seamless task-switching and freedom from system stutter and slow-down. 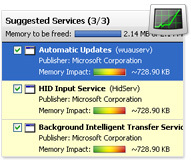 Programs and applications often keep a portion of active memory trapped, even after they’re done using this memory or have been closed. 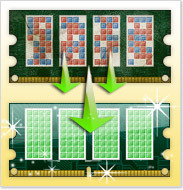 This “trapped” memory reduces the overall amount of available RAM to Windows, slowing your whole system down. Now RAMJet uses a three-tier system to determine with greater precision which apps need the most memory and which are simply hoarding it. The ability to recover trapped RAM even more aggressively can lead to noticeable improvements in launch times, program speeds and overall performance. 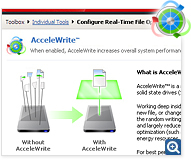 AcceleWrite™ – Optimizes file organization on both solid state and traditional hard disk drives. Working deep inside Windows, AcceleWrite ensures files are written to the hard drive with greater efficiency. 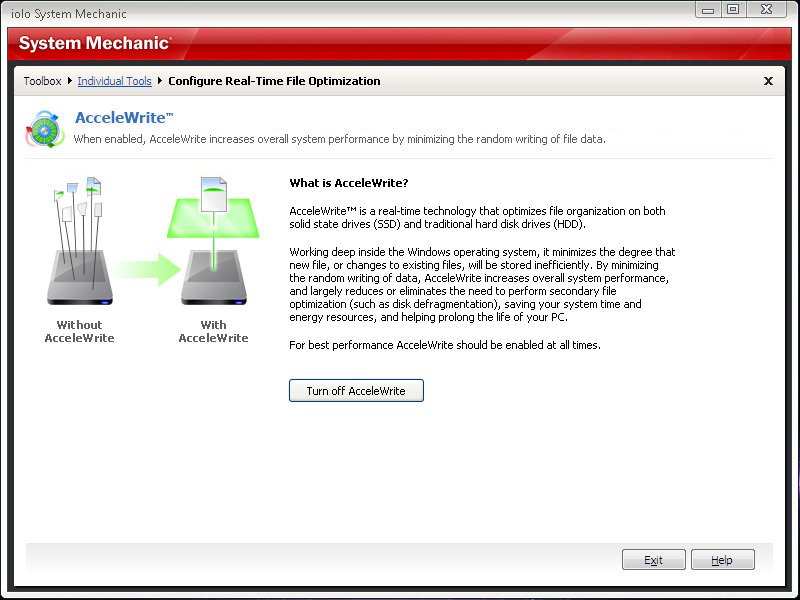 By minimizing the random writing of data, AcceleWrite increases overall system performance and largely eliminates the need to perform secondary file optimization (such as disk defragmentation), saving your system time and energy resources and helping prolong the life of your PC. 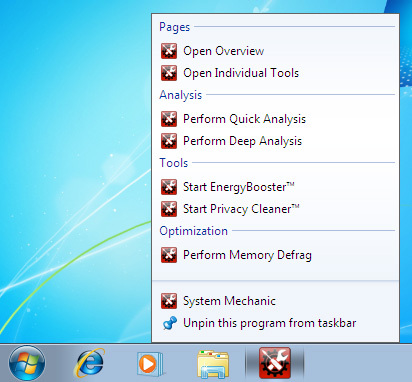 Fully personalize Windows to your needs with dozens of easy-to-find settings in this master menu. Set default programs, change how Windows searches, fine-tune mouse responsiveness or customize any number of other system preferences. 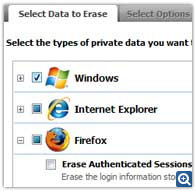 Now available to Windows 7 and 8 users, this powerful tool allows you quick and easy access to many hidden Windows settings, all in one place. This powerful hard drive-monitoring tool uses strategically placed sensors and gauges to keep you informed of hardware health, including internal temperature. 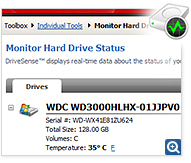 DriveSense has been updated to recognize the latest hard drive types and displays real-time data indicating drive reliability, pointing out beforehand when drives are likely to catastrophically fail. 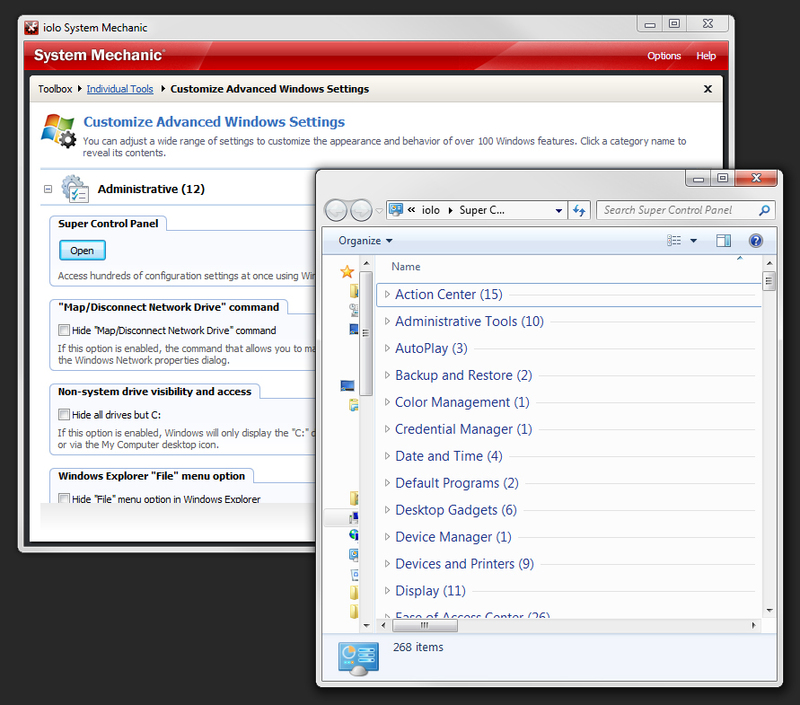 Modern versions of Windows depend on a central communication system that allows software and hardware to exchange critical information before making decisions. Because of its complexity, it is prone to various levels of corruption over time—which can result in a variety of problems. Even the smallest amount of corruption in Windows communication infrastructure can produce false alarms, misdirected files, incorrect reports, confused software, unreliable hardware, and generally unpredictable computer behavior. 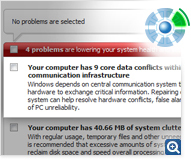 Core Data Recalibrator, a unique technology premiering in System Mechanic, automatically corrects Windows information corruption. 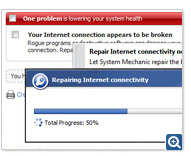 It accurately detects and automatically repairs these problems before they can destabilize a system, keeping Windows and all of your software, apps, and connected devices working in unison so they never miss a beat and your PC is always ready for action. Every new operating system presents its own optimization challenges and Windows 8.1 is no exception. 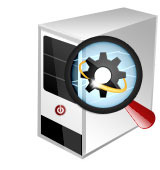 New System Mechanic has been specifically engineered to expand on the performance improvements in Windows 8.1 while at the same time eliminating issues it shares with earlier Windows versions all the way from Windows XP and Vista to Windows 7. 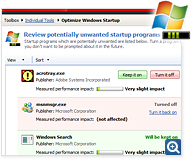 Startup Optimizer – Enhanced and engineered to leverage the already-improved start-up speeds of Windows 8.1 by removing unnecessary programs from start up. 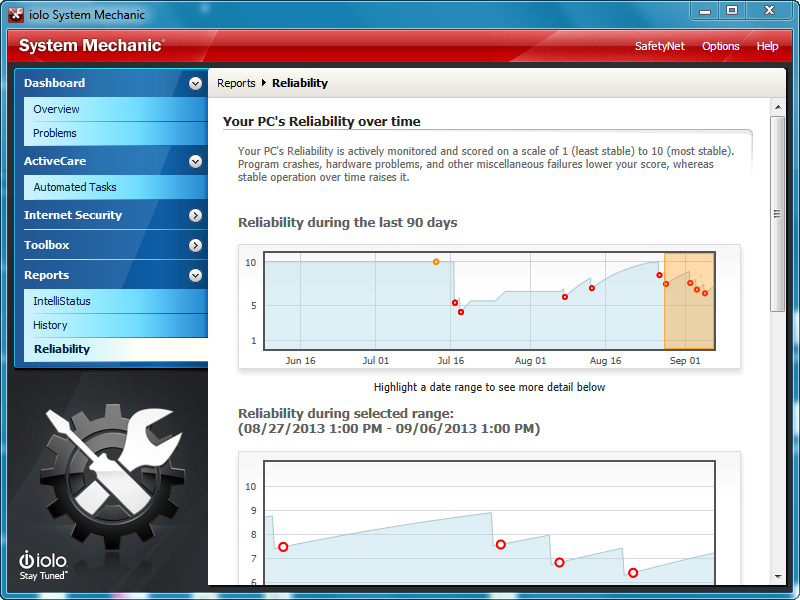 You not only start up faster, but PC response improves with less programs running in the background. 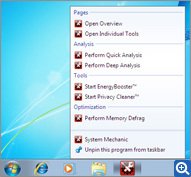 Winspresso™ – Exclusive to Windows 8.1’s new tile interface, Winspresso is a new app that optimizes system memory by reclaiming RAM from background apps not in use. Easy access straight from a desktop tile makes it easy to give Windows a quick energy shot anytime you need it. PC Health Status App – Designed exclusively for the Windows 8.1 user interface, it lets you keep track of your system efficiency and health status at a glance. System Mechanic is now fueled by well over 36,000 independently identified solutions to common issues that arise from everyday use. This makes all the tools and functions that rely on this crucial data more effective than ever before. 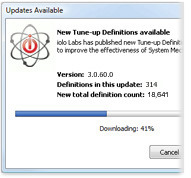 A seamless collaboration of 16 years of iolo’s breakthrough analytics, research, and professional experience, Guided Recommendations harnesses the collective intelligence of the entire System Mechanic community base so you can safely and easily take your PC to even greater heights of performance, even beyond what System Mechanic already performs automatically. 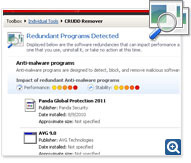 Guided Recommendations fuses together three powerful technologies; Tune-up Definitions™, TrueImpact™ and the collective intelligence of the System Mechanic community to provide guidance on removing additional hidden programs that can bottleneck your PC performance. 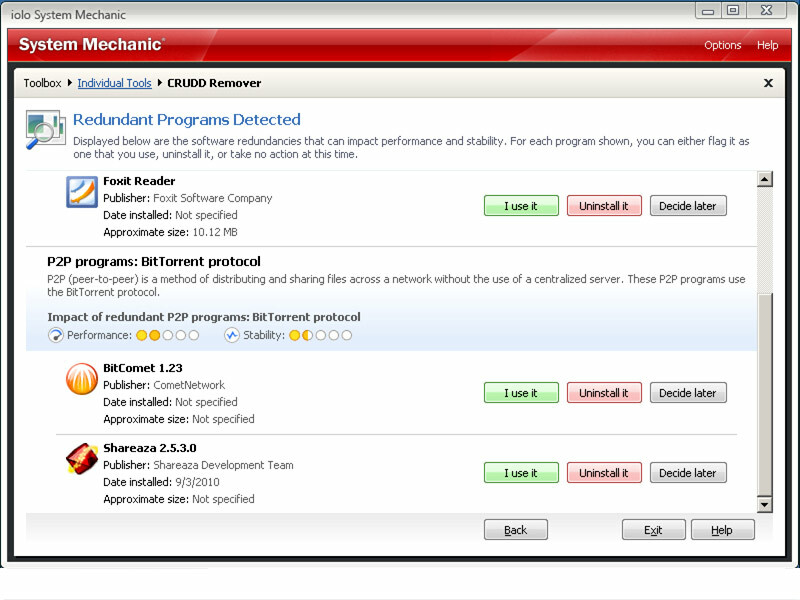 Because no two PCs are alike, each recommendation is tailored to your specific PC, providing insight into which potentially unwanted programs are typically disabled by the System Mechanic community. These collective recommendations, along with detailed descriptions and the impact measurement of each of these programs, gives you the power and to make at-a-glance decisions about how to make your computer faster and more efficient than ever before possible—all in just a few clicks. New advancements coupled with ongoing research from iolo Labs and the collective intelligence of the entire System Mechanic community result in even broader startup coverage. Now it’s easier than ever to identify and root out unwanted programs that silently leach horsepower from startup and other high priority activities. 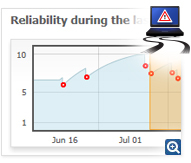 Other products blindly schedule maintenance at specific intervals whether they’re needed or not, and ignore operation-jamming problems that arise between scheduled events. Patented ActiveCare transparently and intelligently keeps your PC running optimally so your system always runs at peak performance levels. 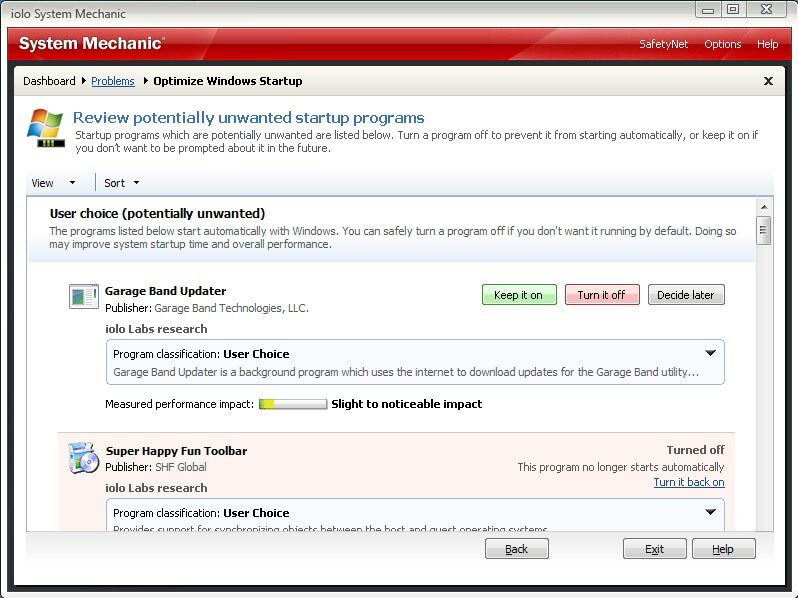 Note: The SSD Accelerator tool applies to Windows 7, Vista and XP. Get more performance and more value with the first-ever software license that lets you use it on all your home PCs, no matter how many you have. The frustration of being abruptly disconnected from the internet—usually right in the middle of something important—it happens even with broadband. 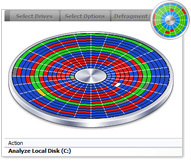 System Mechanic’s fast and powerful disk defrag tool is now engineered to work hand in hand with the patent-pending technology of Program Accelerator™ and AcceleWrite™ to completely optimize your hard drives and critical data for speed and reliability. Designed exclusively for the Windows 8 tiled user interface, the PC Health Status App lets you keep track of your system efficiency and health status at a glance. 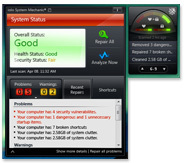 For Windows 7 and Vista, the PC Health Status Gadget provides at-a-glance real-time reports on system health, security, and overall status, straight from your desktop. 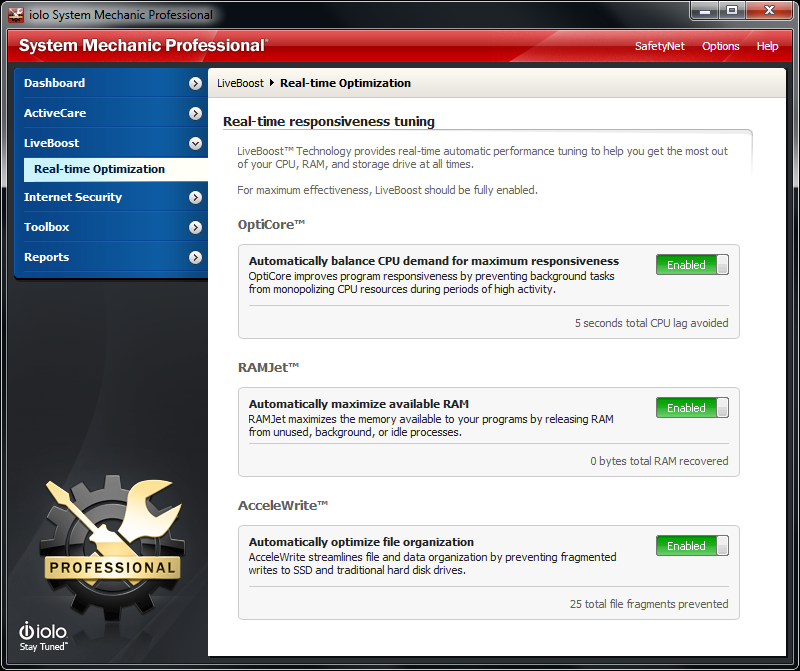 Both the app and gadget include a running list of recently performed repairs and optimizations, and offers quick access to commonly used tools, such as Memory Mechanic® and the new EnergyBooster™. 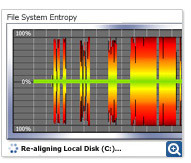 System Mechanic’s Memory Defragmentation tool is designed not only to reassemble your RAM into a neat, contiguous order for significant performance gains, but also to hunt down and release all of the resources held captive by memory leaks within sloppy programs. A multitude of improvements, enhancements, stability augmentations and general fixes have been incorporated into this version for the most effective and reliable performance optimization product to date.